We are the manufacturer of Jewelry Equipment Watch Case Opener Knife. Jumbo Rolex Opener Set is widely used for opening of Rolex watches and is made from high quality material. In line with client's diverse needs, we bring forth a distinguished collection of Case Closing Press. - Used to close snap on watch backs, install bezel rings, etc. This new version of the original Jaxa style case wrench is adjusted to accommodate larger sized watches up to 55 mm diameter. 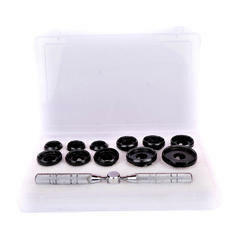 This set includes four sets of three pins (round, flat, square, and curved) to allow you to open all types of waterproof watch cases. Used in turning machine for watch industries and chain cutting. A quick and easy way to open your Rolex watch-cases. Two popular holders and a set of 3 reversible dies. Case opener Rolex Type with Milled Chucks. Size : 18.5, 20.2, 22.5, 26.5, 28.3, 29.5 mm. Available with us is a premium assortment of Watch Case Tools that are known for their sturdy construction and longer service life. These case tools are manufactured by our technocrats utilizing quality-assured raw material. Apart from this, we offer these to the clients at the most competitive prices. Manufacturer and Exporter of Watch Case Openers. 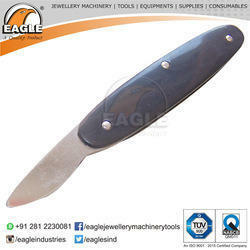 - Watch Case Opener knife (pvc coated). We are engaged in manufacturing a range of watch case opener, that is made out of high grade raw material. This tool is designed to easily open any type of watch with a screw on back. Fabricated using advanced technology, these are provided with long handle to eliminate the risk of slipping. Further, our range is strictly tested as per the international quality standards.